The search is on for the original "Juke Box Hero", the die-hard fan who inspired FOREIGNER's eponymous hit song. FOREIGNER founder, songwriter and lead guitarist Mick Jones and original lead singer Lou Gramm wrote the song following a memorable encounter with a fan at a sold-out show. Interest in the identity of the person was sparked when Canada's Boom 97.3 DJ Stu Jeffries reminisced about the 40th anniversary of FOREIGNER's iconic song "Juke Box Hero" — the basis for "Jukebox Hero The Musical", set to premiere at Toronto's Ed Mirvish Theatre in February. Now, FOREIGNER is looking for that ultimate fan who received divine inspiration from that "one guitar." If you are that fan — or think you know who it is — you could be joining Mick Jones and FOREIGNER in Toronto for the world-premiere event. Help FOREIGNER find that ultimate fan by sharing tips and your personal "Juke Box Hero" story at this location. Perhaps no song is more emblematic of FOREIGNER's iconic arsenal of rock hits than "Juke Box Hero", written by Mick Jones and Lou Gramm for FOREIGNER's 1981 album, "4". Its stylistic songwriting and indelible guitar hooks put "Juke Box Hero" at the zenith of rock 'n' roll sound. Describing the pressures of rock stardom and life, the song is the ultimate tribute to the power of music. The song first entered Billboard's Hot Mainstream Rock Tracks chart in July 1981. Released as the album's third single in early 1982, it subsequently went to No. 26 on the Billboard Hot 100 chart. 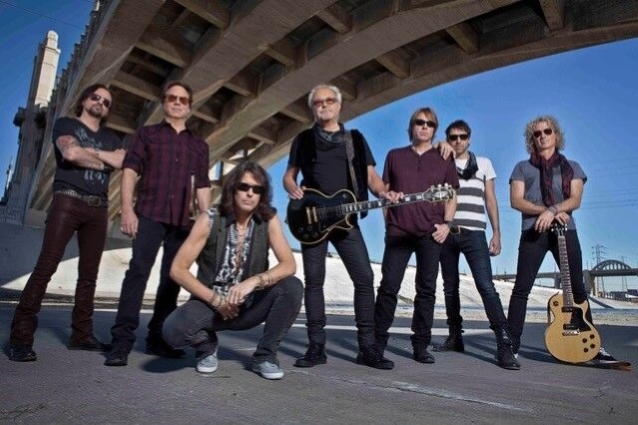 As time goes on, "Juke Box Hero" continues to be one of FOREIGNER's most influential songs, inspiring legions of fans and fellow musicians as one of the most powerful tracks in rock history. "Juke Box Hero" is as relevant today as it was then, recently certified platinum by the RIAA for over a million digital downloads. Mick Jones shares the true story behind the inspiration for "Juke Box Hero" with publication SongFacts: "That stemmed from an experience that we had, I think it was in Cincinnati. We'd gone to the arena for a soundcheck, and it was pouring down rain, and there were a bunch of fans waiting at the door... When we came back for the show later on, all that was left was one lonely fan, a young guy waiting out there in the rain, soaked to the skin. I thought, well, he's waiting like five hours here, maybe we'll take him in and give him a glimpse of what happens backstage at a show. And this kid was just mesmerized with everything. I saw this look in his eyes, and I thought, he's seeing this for the first time, he's having this experience. And I just imagined what was going through his mind. And I'd been toying with this title, 'Juke Box Hero'. I thought it was almost a satire on what we did and how it was perceived from an audience level, and public. That's how it originated."